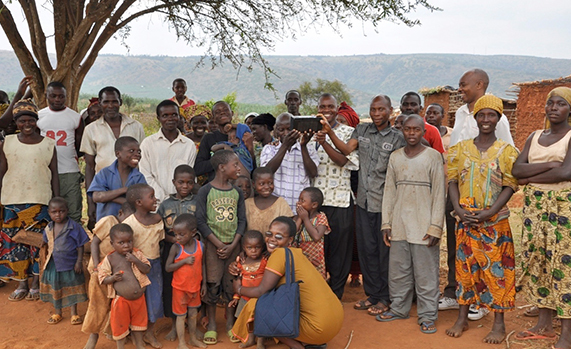 The people of Uganda face significant barriers to Bible engagement. In rural parts of the country, thousands of people have yet to receive a complete Bible in their heart language. In refugee camps nationwide, men, women and children live with broken hearts amidst unrest at home. And in communities across the country, people suffer in the wake of violence and abuse. The Bible Society of Uganda, with support from American Bible Society’s financial partners, is working to make the Bible available and alive for these people—by translating the Bible into unreached languages and equipping suffering people to find healing in God’s Word. Trauma Healing: Throughout Uganda, people suffer in the aftermath of the world’s greatest tragedies. Rebel militia groups tear through villages and murder innocent people. People who have diseases such as HIV and AIDS live separated from their communities. Refugees cope with displacement and separation from loved ones. In the midst of suffering, people need the hope and healing found in God’s Word. But they often struggle to believe that God can heal their wounds. Bible Translation: Uganda is a multilingual country, with more than 40 languages and dialects spoken nationwide. But many of these languages and dialects still do not have a complete Bible. To reach those who are still waiting for the life-changing message of God’s Word in their language, the Bible Society of Uganda must finish incomplete Bible translations and update outdated Bible translations. Trauma Healing: To restore hope to communities throughout Uganda, the Bible Society of Uganda hosts Bible-based Trauma Healing sessions for victims of disaster and abuse. Through these sessions, suffering people learn to identify their pain, forgive their oppressors and release their suffering to Christ. The Bible Society also works to equip trauma healing program facilitators, who can bring this Bible-based trauma healing curriculum to their local churches and communities. Through small group and radio-based healing sessions, the Bible Society of Uganda expects to reach more than one million suffering people nationwide. Bible Translation: With support from American Bible Society's financial partners, translators in Uganda are working on translation projects in four languages: Dhopadhola, Teso, Kusapiiny and Lusamia. In the next five years, the Bible Society expects to provide speakers of these four languages—a total of more than 30,000 people—with access to a complete Bible in their heart language. Pray for victims of war, disease, violence and displacement in Uganda—that by engaging with God’s Word, they may find hope and healing. Ask God to remove obstacles that could prohibit Ugandan Bible translators from completing their translation projects. Praise God for the commitment of trauma healing facilitators and Bible translators as they seek to make God’s Word available and alive in Uganda.